The Pinedale Anticline Project Area and Jonah Fields are located in Sublette County, Wyoming, south of Jackson Hole, north of Rock Springs. The Anticline consists of 197,345 acres, 80 percent surface of which is BLM, 5% is State of Wyoming, and 15 percent is private, with gas reserves estimated at up to 40 trillion cubic feet. The Jonah has a productive area of 21,000 acres and is estimated to contain 10.5 trillion cubic feet, 98% of which is BLM land. 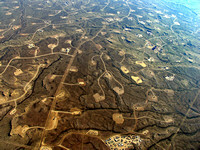 Drilling started in the late 1990s and rapidly expanded from the 500 wells first estimated to many thousands of wells. This rapid expansion and well density changes from what was first approved, was permitted by the BLM. Approval of the density of well spaces was adjusted by the BLM from 40 acres, to 20 acres to 10 acres, down to the current 5 acres per pad. 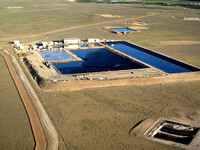 Up to 50 wells can be drilled on an individual pad with the current regulations. EcoFlight’s mission in this area is to protect and preserve the clear air, clean water and abundant wildlife that define the extraordinary Upper Green River Valley in Western Wyoming. 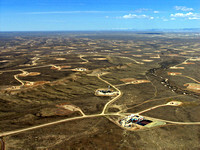 There is substantial energy development on BLM lands here. Gas reserves in the Pinedale Anticline and Jonah fields have proven to be some of the most productive and lucrative in the nation. While development brings increased revenue to the state and solidifies Wyoming’s role as a key energy provider to the country, there is a downside. 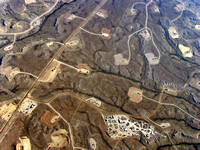 Air quality is markedly poorer than it was before large-scale gas development appeared. 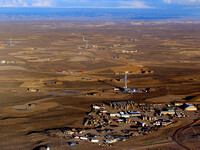 In March 2011, pollution from natural gas drilling in the Upper Green River Basin in western Wyoming triggered levels of ground-level ozone, the main ingredient in smog, worse than those recorded in Los Angeles, one of the smoggiest cities in the U.S.
Documented impacts to wildlife populations, particularly sage-grouse and mule deer, are well known. The oil and gas boom is also affecting the quality of life in small towns like Pinedale, causing spikes in the housing market and adversely affecting tourism, the state’s second largest industry. EcoFlight will work with its partners to ensure that energy development is balanced and responsible and with the least impact on our valuable natural resources.